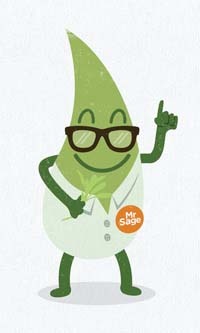 Ask Mr. Sage is our new question-and-answer feature. It is based on topics raised in calls and emails we receive at Flowers by the Sea. Today, I found some oval raised things on the undersides of some Salvia leaves. I think they may be insect eggs. I found a few Whiteflies nearby. So maybe they are Whitefly eggs. What products do you recommend for whiteflies and how often do you treat plants when you discover Whiteflies? Is there a safe spray for Salvias? At Flowers by the Sea, we use predatory wasps (Encarsis Formosa) and beetles (Delfastus catalinae) as our primary Whitefly (Trialeurodes vaporariorum) controls. This generally provides fine results and limits our need for pesticides. The wasps parasitize insect larvae and the crawlers that hatch from them (the oval things). The beetles eat the eggs and adult pests. Very tidy and ecofriendly! However, when necessary, we also use neem oil as well as insecticidal soap sprays containing potassium fatty acids. The National Pesticide Information Center (NPIC) of Oregon State University is a good source of information about neem oil. It notes that this naturally occurring oil from the Neem Tree (Azadirachta indica) acts as a repellent, reduces feeding and affects insect ability to lay eggs. It adds that although neem oil is "practically non-toxic" to birds, mammals and bees, it can cause some injury to fish and aquatic animals. So it may not be a good choice for treating plants close to ponds, ditches or other water features. Clemson University does a great job of explaining how insecticidal soaps limit undesirable, soft-bodied garden insects. Clemson cites two theories as to why that these sprays kill insects such as whiteflies and aphids: First, the sprays may affect the insects' cellular membranes. Second, they may cause dehydration. However, Clemson adds, soap sprays are "virtually non-toxic to animals and birds." Clemson notes that soap sprays are not very effective when mixed with hard water. If that's what you have, then try distilled or bottled water. Follow product directions carefully to avoid any irritation that may occur from inhalation or skin contact. Remember, FBTS is not a licensed pest control advisor. Always read the product label on pesticides and get additional professional information if you have any questions about their use. Information on the Flowers by the Sea website should not be relied upon for pest control decisions. Please consult an appropriate licensed pesticide professional in your area for advice tailored to your situation. Flowers by the Sea is not licensed to give advice concerning the use of specific pesticide materials.